The Mueller Report would give bad publicity to The Trump Prophecy movie. As previously reported, dozens of students from the school’s cinematic arts department have worked with the Charlotte-based ReelWorks Studio to produce a film based on the prophecy of retired firefighter Mark Taylor, who claims God told him in 2011 that Donald Trump would one day become president. Liberty University students were given the opportunity to do hands-on production and post-production credited work for their spring semester film project. As a petition has existed for months in an attempt convince Liberty University to halt its involvement in the project, students and graduates of the Virginia-based Christian college are speaking out about the film as its early October release dates in over 1,000 theatres nationwide draw near. The Liberty students are not only objecting to the political nature of the movie but the fact that it centers on the prophecies of Taylor, who has drawn the ire of many critics for some of his claims. While the movie centers on Taylor, the producers say the movie’s purpose is to show viewers how movement of prayer helped pave the way for the election of the 45th president of the United States. Liberty Cinematic Arts Department director Stephan Schultze had previously told CP that Liberty’s involvement in the project came through his relationship with producer Rick Eldridge, who produced the 2015 documentary based on the book Four Blood Moons by megachurch Pastor John Hagee. He said Eldridge contacted him around Thanksgiving 2017 about the possibility of working on the project. By the start of the spring semester, Schultze had the school’s approval to have students and staff in the department work begin work on the film project. Filming was done in areas of Lynchburg and Bedford, Virginia through March and April 2018. Buy your ticket and grab some popcorn because another feature film driven by Liberty University Cinematic Arts students is slated for a nationwide release October 2 and 4. 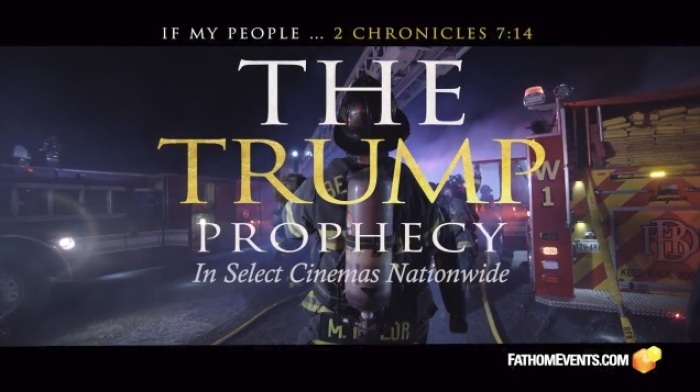 “The Trump Prophecy,” directed by Executive Director of Cinematic Arts Stephan Schultze, is based on a memoir of the same name by Mark Taylor and Mary Colbert. The story follows the events surrounding Taylor’s battle with PTSD from years of service as a firefighter. While the initial announcement of the film was met with some controversy by the student body, Schultze said that Cinematic Arts students were excited for the learning opportunity. About 65 cinematic arts students participated in film production and filled roles from set design to sound engineering to camera work, Schultze said. Additionally, alumni of the program served as department heads on set. “(Alumni) come back and train the next generation of students going through, and those students are making immediate contact through the alumni association that’s out there working — it’s feeding back on itself,” Schultze said. Though the film was produced by ReelWorks Studios of Charlotte, North Carolina, the entire film was shot in Lynchburg and Bedford, Schultze said. Many of the sets were constructed on the second floor of the former Macy’s department store located in Lynchburg’s River Ridge Mall. The film crew also collaborated with the Bedford Fire Department to ensure safety during filming scenes that included fire. Filmmaking is a collaborative effort, as people band together from all departments and disciplines to write, produce and market a film. Schultze explained that ReelWorks is covering the marketing for the film, which will be released to 1,200 theaters nationwide — more than double the number of screens from 2017’s “Extraordinary,” which graced 400 screens. Though this is the second nationwide theatrical release for a Liberty student-driven film, it is the fifth feature film that the film school has produced since its inception six years ago. Giving students this type of hands-on learning is what makes Liberty’s film program unique, according to Schultze. “The Trump Prophecy” will be released to 1,200 screens Oct. 2 and 4. For more information and to find a theater, visit thetrumpprophecymovie.com.